It’s the 21st century – so why are printers still so bulky, ugly and wasteful? The time is ripe for printers that fit into the world of iPods, cell phones and paper-thin computers, and concept designers are stepping up to the plate with incredible visions of the future. Tiny stick printers that can go anywhere, printers that use pencil stubs or even coffee dregs in lieu of ink cartridges, printers that can erase and reuse paper. Some designs go further still, transcending mere ink to produce three-dimensional objects and even food. The problem with printers is, if you make a mistake, there’s no way to erase it. You simply have to start all over again, wasting both ink and a sheet of paper. So why not use graphite instead? 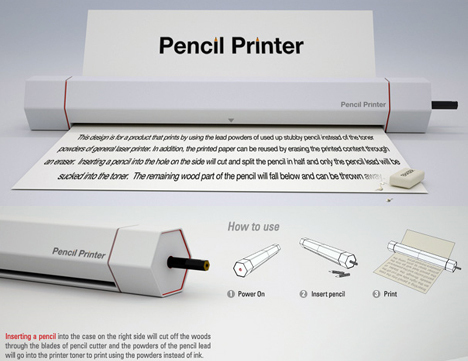 This creative printer concept by Hoyoung Lee does that and more, using the nubs of old pencils that would otherwise be thrown away and even offering a built-in eraser for the second go ‘round. The built-in eraser function in the first design is ditched in this reworking by Hoyoung Lee, Seunghwa Jeong & Jin-young Yoon, making the printer a lot more compact. Sure, erasing by hand is more work, but you can do a more thorough job on your own anyway. Nobody likes buying printer cartridges, and it seems like we go through them so quickly. So it’s nice to see innovation that drains the last drops of ink out of colored ball point pens as a supplement to regular printer ink. 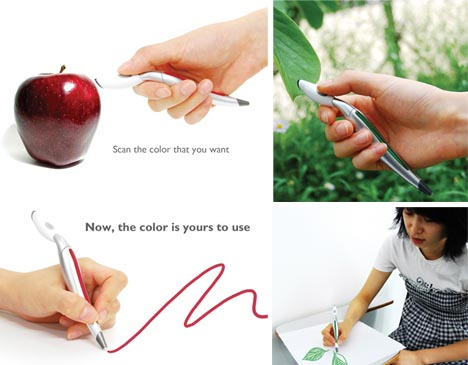 The design may not work as-is, since ballpoint ink tends to be thick, but it’s an interesting idea. Coffee and tea are loaded with pigment and in fact often used as dye, so it makes sense to use them as a natural, free, recycled form of ink. 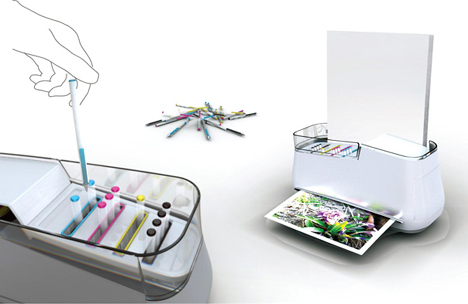 This printer would allow users to place coffee or tea dregs into an ink case, eliminating the need to constantly purchase costly cartridges. 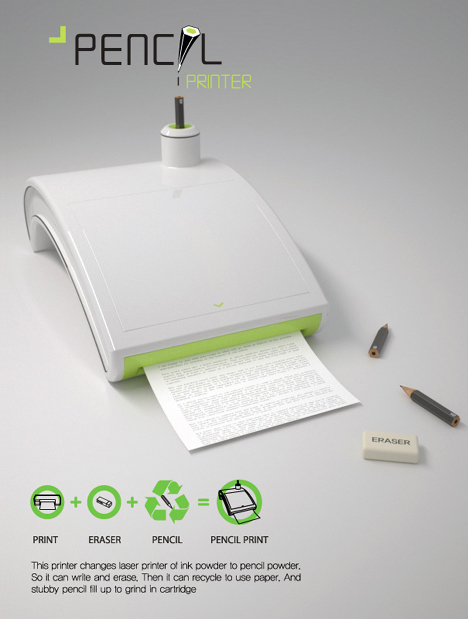 A printer, scanner and pen in one? This pen makes it possible to write with any color from practically any object you can find, scanning the color and reproducing it from RGB ink cartridges. The design obviously has its limitations, considering the small size of the ink cartridges, but it’s an absolute dream for artists and could be useful for a range of everyday needs as well. Remember the days when we were all chained to our desks while on the computer or talking on the phone? Gadgets are going portable in ways we never thought possible a decade or two ago, so why not printers too? 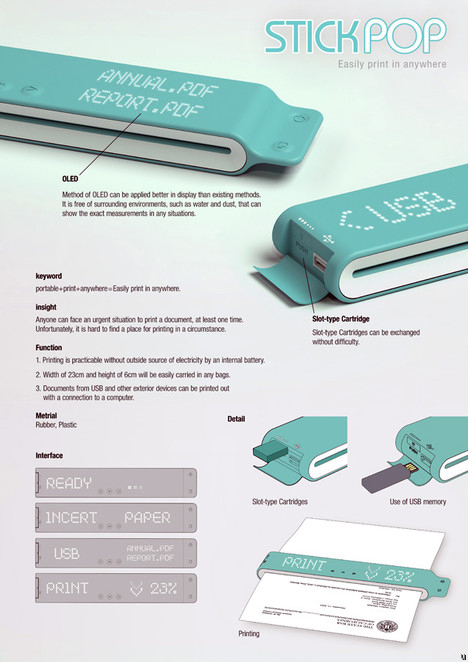 The StickPop printer concept is battery-operated, prints via USB cable and is small enough to fit in your laptop bag. The PrePeat takes all of the above concepts and goes one step further: eliminating paper from the equation. 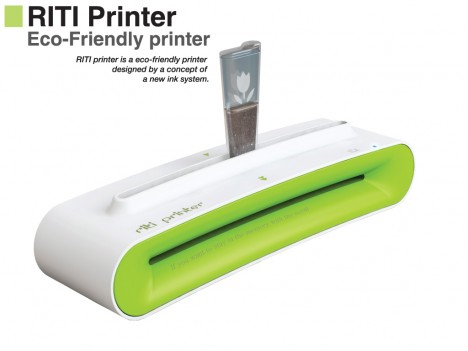 This eco-friendly printer uses special paper made of PET plastic that can reportedly be used up to 1,000 times each. 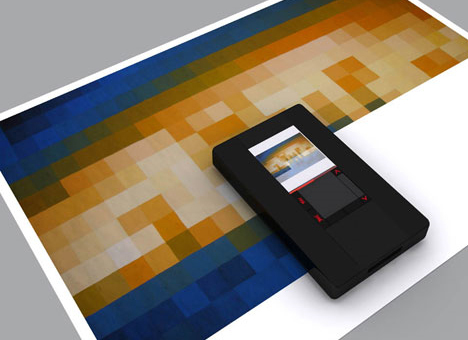 The printer, which uses no ink or toner, automatically clears used sheets and reprints. It’s a cool idea, but the cost is definitely prohibitive for now at $5,600. 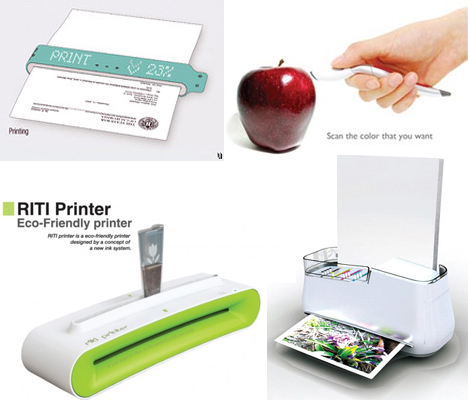 Want to print absolutely anything, anytime, anywhere? The combination of ZINK paper, which has colored dye crystals embedded in it, and the “Mini Giant” crawling printer can produce practically anything – even large-scale posters. The Mini Giant propels itself across a piece of ZINK paper to create a print using heat-based technology. If you have even the slightest fear of computers taking over the world, this self-replicating 3D printer may be fodder for your nightmares. 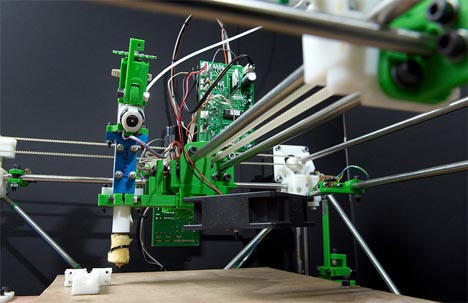 The RepRap can manufacture complex three-dimensional objects… including copies of itself. But, Terminator implications aside, this thing is pretty cool: it turns your home office into a mini factory by simply downloading plans and then molding bars of plastic into various household goods. Using a Printer to Make… Food? Considering that some printers can replicate, it’s not too crazy to imagine 3D printers that can cook and assemble food at the push of a button. 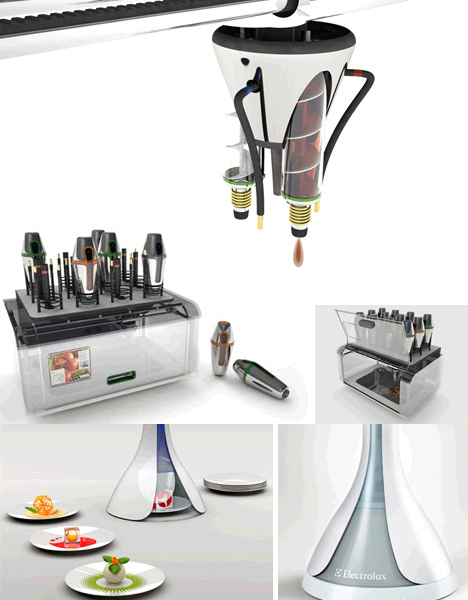 Some futuristic food printer concepts imagine gadgets loaded with ingredients that can be whipped up into practically anything imaginable, though it probably wouldn’t taste much like the food we enjoy today. When it comes to printing on toast, many of us ask “why?” but just as many respond “why not?” While toasting a design onto bread is pretty impractical, it definitely makes this boring breakfast staple a little bit more fun. 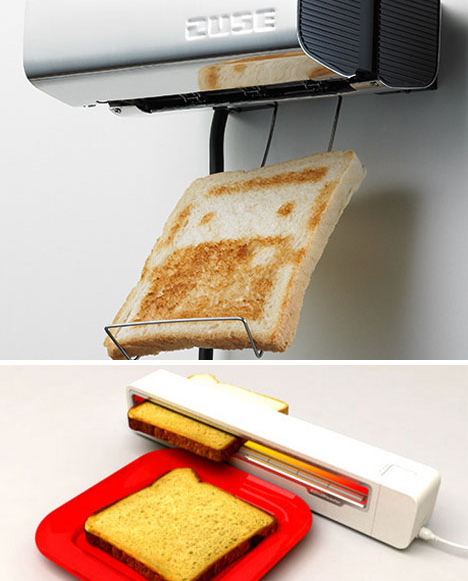 While the ‘Zuse’ toast printer (top) is more about form, the roller toaster is actually functional. 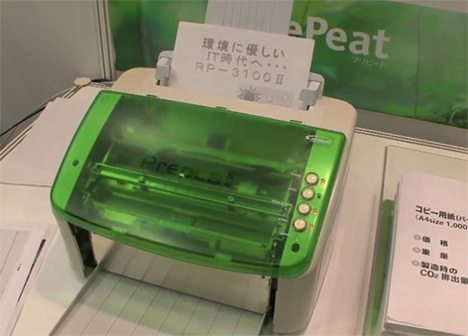 It doesn’t print an image on the bread, but works like a printer, passing a piece of bread from one side to the other. If printers can create designs on paper, why not change up the surface? 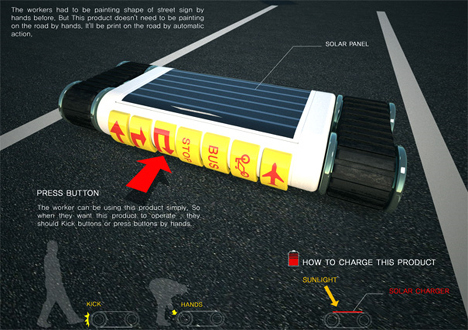 Road workers could get a lot more done by letting this solar-powered Road Printer do most of the work with pre-programmed templates and a jet-spray paint cartridge that moves from side-to-side between the wheels.